Comet 200113A Clutch Springs. Package of 2. “Green” springs for 350 Series Clutch. 1300/1500 engagement. Home > Comet Clutches and Parts > Hoffco Comet 208119S Two-Man Auger Clutch. > Hoffco-Comet 207795S Clutch for Hoffco Earth Augers > Hoffco-Comet 217895S. PH2000-E Earth Auger replacement clutch. > Comet 202296S, (QTY 2) YELLOW SPRINGS, 350 SERIES CLUTCH > Comet 200113A Green Clutch Springs. Package of 2. “Green” springs for 350 Series Clutch. 1300/1500 engagement. Comet 200113-A. 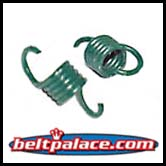 Comet 200113A Green Clutch Springs. Package of 2. “Green” springs for 350 Series Clutch. 1300/1500 engagement. Comet 200113-A. Comet 200113A Clutch Springs. 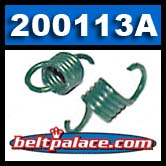 Package of 2 “Green” springs for 350 Series Clutch. Comet 200113-A. 1300/1500 engagement. Comet 350 Auto Centrifugal Clutches have the option of specially pre-stressed springs in various tensions. 350 Series Clutches for up to 6HP 4-cycle engines and 9HP 2-cycle engines come standard with the “Red” 200114-A Comet spring at 1800-2000 RPM engagement (about 100 revs. above high idle for most 4-cycle engines). Comet 200114A Red Clutch Springs. Package of 2. Standard “Red” springs for 350 Series Clutch. 1800/2000 engagement. Comet 200114A Red Clutch Springs. Package of 2. Standard “Red” springs for 350 Series Clutch. 1800/2000 engagement. Comet 200114-A. Comet 200115A Brown Clutch Springs. Package of 2. Standard “Brown” springs for 350 Series Clutch. 2200/2400 engagement. Comet 200115A Brown Clutch Springs. Package of 2. Standard “Brown” springs for 350 Series Clutch. 2200/2400 engagement. Comet 200115-A. Comet 200116A White Clutch Springs. Package of 2. Standard “White” springs for 350 Series Clutch. 1100/1300 engagement.